Andy’s Frozen Custard Corporate Offices are now housed in the Harry Cooper warehouse. Built in 1913, the warehouse consists of two one-story shop areas connected by a three-story brick and concrete warehouse. 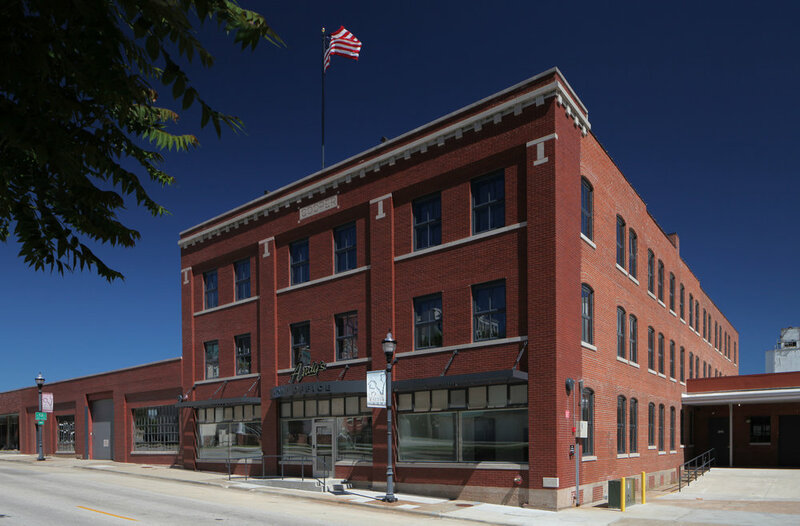 Stabilizing the warehouse was a necessity for this Historic Tax Credit project; the exterior of the warehouse required brick restoration, and special flood-proofing was completed due to its location over the Jordan Creek Tunnel. Though the restoration of the exterior is impressive, it pales in comparison to its interior, which was designed in collaboration with Hufft Interior Architecture. Existing brick and exposed concrete act as a perfect foil for natural walnut and black steel. Re-purposing was important to this project; the original window’s wire glass was re-purposed into wood restroom doors and wood-screened office walls. Antique mechanics are highlighted by natural light from the old elevator penthouse.